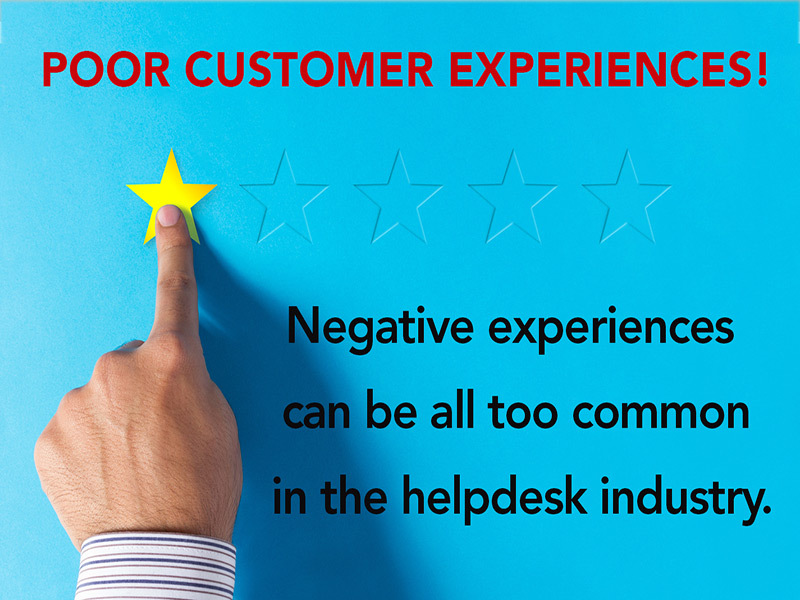 Some negative experiences that are all too common in the helpdesk industry. IVR, or Interactive Voice Response is a very common method for routing callers. In its most innocuous form, you have to sit through a series of options and choose the one that best matches the reason you are calling. In its most pervasive and frustrating form, a caller finds themselves in a kind of telephonic hell, mashing buttons and screaming into the telephone receiver at an uncaring mechanical voice, desperate to speak to an actual human being. While ostensibly IVR is nothing more than an automated version of a telephone receptionist. It is usually used to route phone traffic away from humans. Many do not even openly offer an option for speaking to a “representative” and mashing “0” repeatedly won’t always get you there. I can think of no better example of a tool that is universally loathed by customers and callers (or at the very best, barely tolerated) and yet is employed ubiquitously. How a company sets up and utilizes their IVR can make a big difference in the customer experience. When used sparingly and carefully, that experience will be tolerable. When used as a way to redirect callers away from live representatives, as a kind of “audio maze,” a company can almost guarantee that it will anger and frustrate customers who are already likely frustrated by whatever led them to make the call in the first place. In either case, best or worst, the average customer would still rather speak to a person than have to navigate a list of options with a mechanical voice. Tiers of support are almost as common as the use of IVR’s. While not as onerous for a customer as an IVR, the tier system has its own drawbacks and can lead to negative experiences. A well run tier system will be nearly invisible to the customer. Sadly, many are not well run. Less seasoned representatives will, at some point, need to escalate a case to a more seasoned representative. A representative woking in one department will sometimes need to transfer a case to a different department. The transfer process is frequently frustrating for the customer. How often have you called a company only to have to give your information multiple times to multiple people and departments because the information you provide one person does not transfer over to the next? I once counted no less than 21 transfers in a single call when I attempted to call a company over a seemingly simple transfer of services from one state they served to another after I moved. I even missed a call while I was on hold with transfer number 20. When I looked the missed call up later, it turned out to be that same company’s automated survey system calling to find out how my support call went! While this is extreme and egregious, it highlights the problem perfectly. Each time I spoke to a new person, I found myself having to explain myself again, or correct some misunderstanding they had about what I was trying to do. Each part of the company, including the automated part that sends out surveys, was unaware of what the other departments and people had already gone over with me. The transfer process, if handled as poorly in as it was in the previously described experience, not only angers and frustrates the caller, it is a tremendous waste of time and loss of efficiency for the company involved. It may be tempting to just make the caller do the “leg work” but in the end, that caller is very likely to resent the experience and you might not save company time and resources, which presumably is the entire point of doing it this way to begin with. Another aspect of the tier system involves scripts. Many companies hire, what has sometimes been described as “anyone with a pulse” for their lowest tier. The company will then hand that person a script of answers and steps, impressing upon these representatives that they cannot deviate from these steps. This allows a company to field a new representative with minimal training and allows for greater flexibility when hiring. It also leads to the all-to-common experience of a customer interacting with this person in much the same way as they have to interact with an IVR. That representative has a series of “pre-programmed” responses that they absolutely will not deviate from. We all prefer talking to a person over an IVR because we assume that a person will listen to our issue, demonstrate understanding of that issue, and apply critical thinking to come up with a solution or answer. In the very least, we expect them to be able to efficiently identify the person who can help us, if they are unable to. Too often, the script bound representative is more of a barrier to getting to the real answer, rather than a part of the solution. Any one of the above can be frustrating enough, but they frequently occur together. The following portrait will be all to familiar to anyone who has had to call a company on more than one occasion. You search a website designed to deflect your attention away from the company’s phone number. Once you finally find the number and make that call, you find yourself listening to a recorded voice listing off a series of options, none of which are quite what you need. Also, none of which seem to lead to a person. Perhaps you mash the “0” button on your phone, or after digging through several menu sections, find the prompt to get you to a representative. The machine voice will ask you for some personal information so it can “direct you to the best department” and then you sit on hold while you wait for a line to open up. The person that finally answers asks you for all of the same information you gave the machine voice earlier. You try to explain your issue but the person just doesn’t seem to understand you, and they keep going down a different track. The experience is eerily similar to talking to the machine voice. Finally the representative tells you that they need to transfer you to a different person and you are put on hold again. A new person finally answers and then proceeds to ask you for the same information that the machine and the first person asked you. You have now spent 30 minutes on the phone and are more than a little annoyed. I wish the above were hyperbole, but I’ve personally experienced this exact chain of events multiple times in the same week with multiple organizations. Most of these aggravations could have been avoided with some changes in procedure and a bit more care on the company’s part. If a company truly cares about fostering a positive customer experience, they will do just that.